Birdman George put a finger to his lips and stared into the tops of the trees cloaking the makatea, the ring of fossilised coral that encircles the island. Somewhere overhead a twig flexed and a bird chirped. He pressed his lips to the back of his hand and chirped back. The bird called again and flitted to a lower, closer branch. Another joined it, two chirpy, inquisitive balls of golden feathers hopping from twig to twig just above our heads. The kakerori was until recently one of the world’s rarest birds. 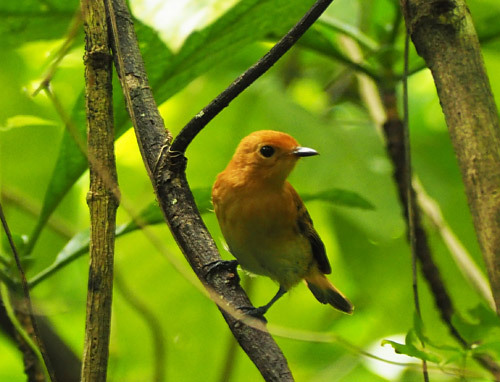 Also known as the Rarotongan flycatcher, until recently it was one of the world’s rarest birds with a global population of just 29. Now there are hundreds, thanks to the efforts of people like Birdman George. Atiu, the Birdman’s home, is one of 15 islands scattered across two million square kilometres of ocean that make up the Cook Islands. It doesn’t have the spectacular lagoon of Aitutaki or the tourist facilities of Rarotonga so it gets only a fraction of the visitors. What is does have is serenity, welcoming locals, caves and birds. Lots of birds. 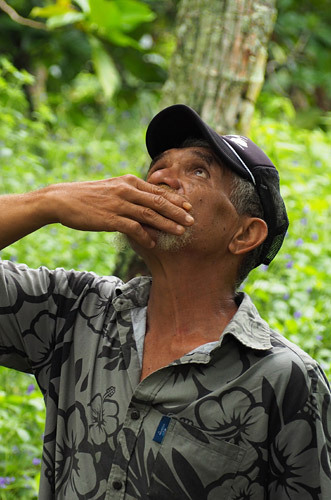 The Birdman isn’t a trained scientist — he calls himself “a naturalist from the bush” — but what he doesn’t know about Atiu’s natural environment isn’t worth knowing. And with his cheeky humour and a handlebar moustache worthy of a veteran Harley Davidson rider, he probably also knows he has become as much of a tourist attraction as the birds themselves. Birdman George calls to a Rimatara lorikeet. 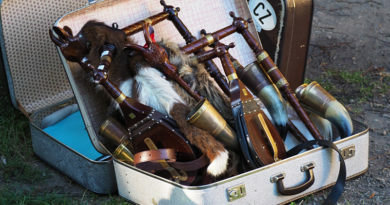 A Canadian couple had also booked the Birdman’s tour so the three of us — half the visitor population on Atiu that day — piled onto the back of his truck. We hadn’t even left the car park before he pointed out a bird with a pale green body and a watermelon-pink crown cooing from a branch. Our first bird of the day was a Pacific fruit dove or kukupa, the same name used by Northland Māori for the native pigeon. George showed us that Atiu’s bush is in fact a giant self-service pharmacy with plants that can treat cuts, diabetes and high blood pressure. The tips of the banyan tree’s roots heal mouth ulcers while the juice of the noni fruit, which reeks of blue cheese, is an insect repellent. But the bush wasn’t just George’s pharmacy, it was also his supermarket. That day it stocked bananas, wild yams, breadfruit and wild pigs caught in simple traps made with a noose and a bent sapling. Food was everywhere. Overhead we saw several frigate birds, whose angular silhouettes helped guide ancient Polynesian navigators to land, a white tern and a pair of blood-red lorikeets, but our greatest success was the kakerori. We were just a few metres into the bush when the birds answered George’s calls. Within minutes three juveniles, still wearing the orange plumage of youth, and two greyish adults were flitting around our heads, chirping merrily. One darted centimetres from my face, so close I felt the draught from its wings. “They like you,” chortled the Birdman. Lunch on the Birdman’s tour is gathered from the forest. 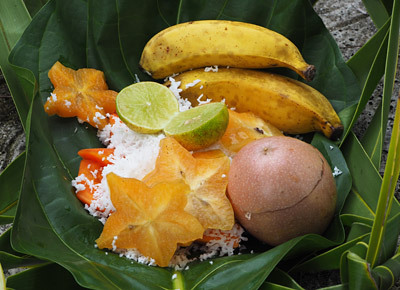 The tour ended at a surf-pounded beach with a lunch George prepared using a machete and fruit gathered in the forest, served in a plate woven from a palm frond and sprinkled with lime juice and coconut. The Birdman, real name George Mateariki, told us he had spent 13 years working for the Forest Service in Rotorua, where he met his Kiwi wife. A stint in factories in Australia followed before the birds and bush of home called him back. 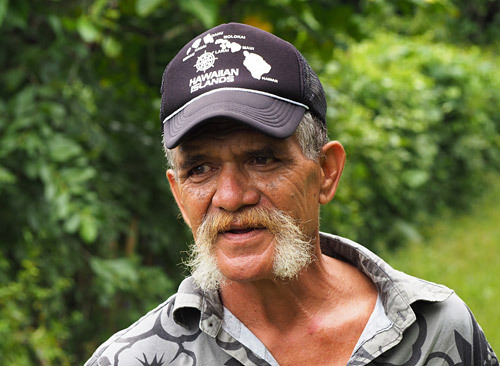 Much of his knowledge came from growing up on Atiu. The rest came from listening to the scientists who visited the island also known as Enuamanu, the island of birds. One of those scientists, Ed Saul, happened to be carrying out a bird count during my visit. 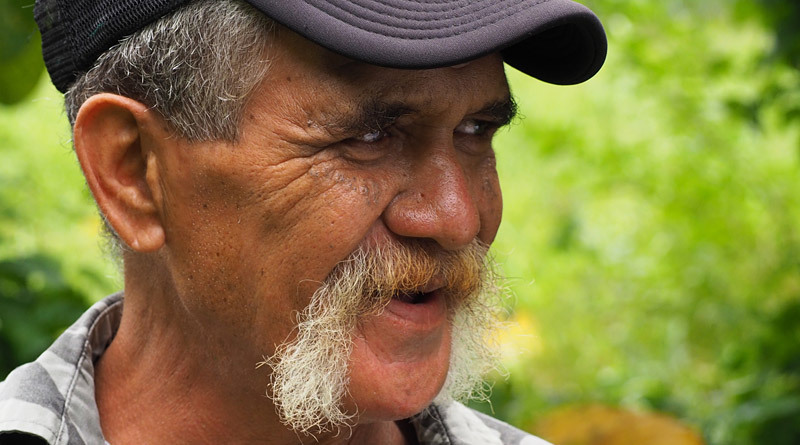 Ed was working with the now defunct DSIR in 1989 when he read about a conservation programme on the Cook Islands. He took long service leave and never went back. 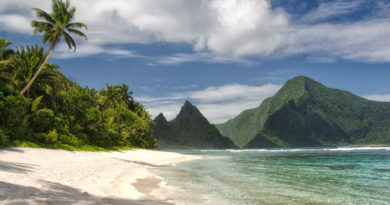 When he arrived there were only 29 kakerori on the planet, all of them in two small valleys on Rarotonga. Cats had played a part in their demise but the ship rat just about finished them off, he said. Birdman George is as much of an attraction as the birds themselves. 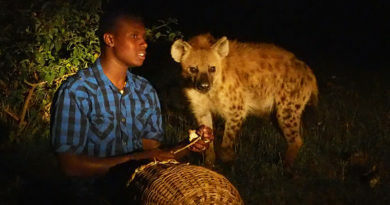 Kakerori numbers increased steadily once the Takitimu Conservation Area was set up and volunteers started laying rat poison. When the population hit 200 some of the birds were transferred to Atiu, creating a backup in case disaster struck Rarotonga. Atiu also had the advantage of being free of ship rats. Forty young birds were relocated between 2001 and 2008. 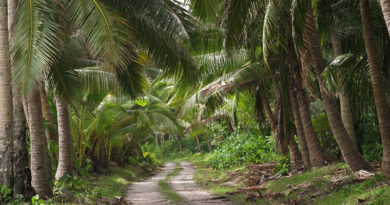 As of February this year there were about 440 on Rarotonga and 125 on Atiu, Ed said. They aren’t out of the woods yet — Ed is trying to work out why their population has been flat-lining on Atiu for the past few years — but they are no longer knocking on the door of extinction. Ten years ago another, more spectacular bird was introduced to Atiu. The once widespread Rimatara lorikeet, known in the Cook Islands as kura, had survived only on the tiny island of Rimatara in French Polynesia. It was under pressure even in pre-European times because the scarlet feathers on its belly were used to decorate chiefs’ loincloths and headdresses. Up to 1000 birds were needed to make a single loincloth. A white tern peeks from its no-frills nest atop a branch. However, in a story which is depressingly familiar across the Pacific, the arrival of rats on European ships wiped out the kura everywhere but Rimatara. 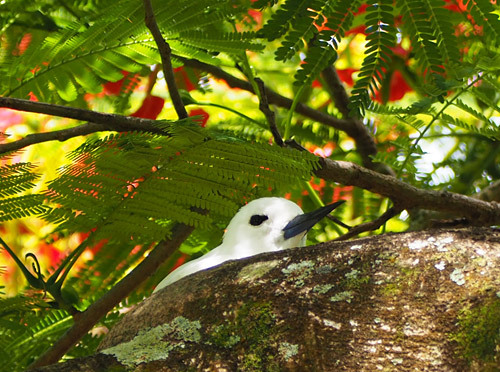 In 2007 the Cook Islands Natural Heritage Trust transferred 27 kura to Atiu in a complicated operation that involved moving protected birds across an international border. The other complication was Atiu’s mynahs. These aggressive birds had been introduced in 1916 to control an insect pest before themselves becoming pests. They started attacking the kura within minutes of the newcomers’ release. The only way to rid the island of an estimated 15,000 mynahs was to get the whole community involved, Ed said. The bounty started at $1 a bird and rose as the mynahs became scarce. By the end of the cull a single trapped or shot mynah fetched $350. Today Atiu is home to about 500 kura, which are easily spotted thanks to their vivid red belly, green wings and a blue patch behind the eyes. George Mateariki with his Hotspot Hero award. Ed said many people were involved in looking after Atiu’s endangered species but he singled out Birdman George for special praise. George was key to the birds’ protection and monitoring, and his never-ending vigilance at the harbour and airstrip kept ship rats off the island. 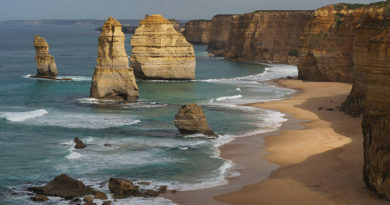 That contribution was recognised in 2016 when the Critical Ecosystem Partnership Fund honoured 15 people around the world for their work in ecological hotspots. 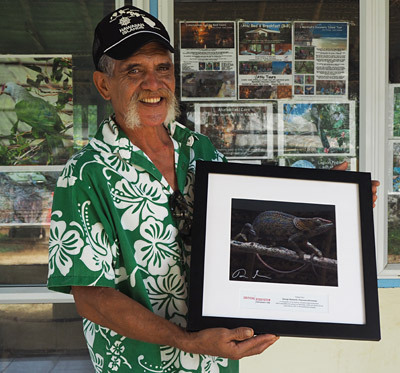 Birdman George was named the Hotspot Hero for Polynesia and Melanesia and flown to Hawaii to collect his award. “I was very proud to put the Cook Islands on the map. It’s like winning a gold medal in the Olympics,” the Birdman said. Better than any award, however, was knowing he’d made a difference to the birds he loves. “We saved this little guy from extinction,” he said, pointing out a kakerori still fluttering in the branches. The author visited Atiu with assistance from Cook Islands Tourism.